This is my second article on how to build a role-based access control system in SQL. In the first article I gave a high-level overview of access control systems in general, especially in the web-application context, and talked about how some Access Control Lists (ACLs) are implemented. I introduced the problems I designed my system to solve, and gave a roadmap for where this series of articles will end. I finished that article with a sketch of some basics to provide row-level read, write, and delete access control. This article picks up where I left off. I want to revisit some things I swept under the rug in the first article, because I didn’t want to throw all the complexity in at once. I’ll explain my current system’s full functionality, which includes roles, status, type checking, and table-level and set-level privileges. I will show you the design in detail, and give working examples and ready-to-run SQL queries. I’ll also explore ideas for extending or restricting functionality, because your application isn’t likely to be the same as mine. I’ll mention possible optimizations, because performance and scalability are important design goals. I’ll end with a brief explanation of how I’ve used this system to make my own web applications simpler and more secure. If you haven’t already, you should read the first article before continuing with the rest of this article, because I’ll assume you have the context it provides. Let’s finish the discussion about roles I pushed aside in the first article. When a user acts in a role, it “acts in the capacity of” that role. When a user is a member of a group, my system permits the user to act in that capacity—to assume that role. I don’t want to go into the details of roles and role-based access control, partly because it’s way outside my expertise, but I want to point out that acting as a member of a group is only one way to implement roles. There are others. The trick to making roles work well is finding the right level of granularity. To accomplish this, I’ve defined some special roles in my system. In this article I’ll demonstrate how to implement the “self” role, but many others are possible. Anything you can deduce about the relationship between a user and an object is a candidate for a role, should you need it. For example, if your system records who creates each row, you could implement a “creator” role. If your schema tracks who supervises employees, you could have a “supervisor” role. As I said, groups are subsets of roles, which is why they are often a convenient way to implement a role. To carry the example a bit farther, you can implement the “supervisor” role by looking at data to determine if the user is in a supervisory relationship to the object, or you can just add all supervisors to the “supervisor” group. The latter approach is a bit coarser, because it would allow a user to act as a supervisor on a user she doesn’t actually supervise, but you gain simplicity and speed. The “self” role is similar, but in this case you obviously want the fine-grained control of saying “a user is only allowed to act in the self role upon herself.” Adding everyone to the “self” group would accomplish nothing. I’ve already used roles in the previous article, though I didn’t encourage you to think of them that way yet. The roles I demonstrated are owner, owner_group, and other. These are implicit in UNIX privileges. Later I’ll show you how privileges are assigned to roles explicitly. Another topic I put aside, but used implicitly, was actions. Actions are important because they’re the verbs in the “can user X do Y to object Z” question. The three basic UNIX-style actions I introduced in the first article are “read,” “write,” and “delete.” As with roles, I’m going to make them explicit in this article. I’ve already introduced the “event” data type. What actions can a user take on an event, besides the basic three? I can think of “join” and “withdraw.” Since actions are verbs, chances are your application already defines a lot of actions as class methods, and you may even maintain a list of actions as part of your design process. Actions are the first place where type matters. I’ve mentioned that objects in my system are both typed and identified; that is, you need to know both the table and the ID of a row to apply privileges to it (you didn’t need to know the table in the last article). Certain actions will apply to all types, such as read/write/delete, but others will only apply to specific types—a natural concept in object-oriented programming, which I assume you’re doing if you’re using an ORM (Object-Relational Mapping) system. I find it useful to define a generic set of semi-UNIX-ish actions, which can be applied uniformly to every type by common code. These let me build “property pages” automatically, which are important when I need to administer the properties of different types of objects. Some examples are stat, chmod, chgrp, chown, chmeta, view_acl, and add_privilege. Other actions apply only to specific types. The c_apply_object column specifies whether an action applies to objects or tables. Certain actions, like “create,” apply only to tables. I find the system is easier to manage if I choose my actions so they can only apply to one or the other, not both. In my applications I typically add more columns to define user-interface labels and so on, but I omit them here. Actions will return soon, but I want to talk about statuses first. It’s happening again—the code is taking too much responsibility. Shouldn’t the code just be asking if the event is joinable? In fact, isn’t it cleaner to make privileges contingent upon the event’s status? If you haven’t really explored this possibility in your own code, I encourage you to do so. My personal experience is it’s a much better way to do it. Think about the places in your code where you could omit checking something’s status before doing something to it. You might get rid of a lot of code. While this represents reality better in one way, it mis-represents it another way. What if $user->can('join', $event) returns false? Is permission denied? Maybe not; maybe the event just isn’t active. This makes it a little harder to understand why a user can’t join an event, but in practice I find this almost never happens in my applications. The applications are built by asking what the user can do, so no user ever gets a link to join an event that’s not “joinable,” whatever that means. Mashing status and privileges together is a trade-off, but the upside (performance and managability) is so great, I think it’s overwhelmingly worth the slightly unfaithful representation. In a bit I’ll show you how to do this. I said actions are only valid for certain types of objects, but that’s not represented anywhere in the privilege system. I’ve said I’m going to mix privileges and status together for the many benefits it gives. Should I also mix types into the recipe? There could be one good reason not to do this: Once And Only Once. The code might already define what actions are valid for what types, if your system is very object-oriented. On the other hand, your code might not be that strictly object-oriented, and you might want the application to be able to take actions that don’t correspond to an object method. I find this is the case in my code, because I don’t live in the Kingdom of Nouns. In this case you do want the privilege system to know which actions are valid for which types. But there’s another reason, too: your types probably share some actions. Here’s one example from my application: memberships and events can both be activated, so the ‘activate’ action applies in more than one place. In fact, some actions are even shared more than twice in my system, and in some cases they don’t apply in the same statuses. In this case, I think the relational database is the best place to store this information. In this table, the c_status column is not a single-valued integer; since an object might support a given action (such as “delete”) in several statuses, the statuses are packed in bitwise. If an action is always valid for a given data type, I set the c_status to 0. Rows only need to be in this table if the action applies to objects, because tables don’t have a type (they are a type!) or status in my worldview. “object”: a regular object-level (row-level) privilege. “table”: a privilege granted upon a table itself, as opposed to its contents. For example, “create” cannot be applied to an object, because an object has to exist for a privilege to apply to it. “create” can be granted upon a table, which allows a user to create a row in that table. “global”: a privilege granted on all rows in a given table. For example, officers ought to be able to view details on every user—details which might be hidden from other users. A single global privilege in the ACL can grant this. I store privileges two different ways. First, there are the UNIX-style privileges I’ve already explained. These are clearly object privileges, because they are defined directly in the row. I find these take care of nearly all my needs. c_who is needed if c_role is user or group, and holds the user or group ID to which the privilege is granted. c_action is the action the privilege grants. This is always required. c_related_table holds the name of the table to which the privilege applies. This is always required, though in the case of a “self” privilege it’s redundant because a “self” privilege always applies to the t_user table. c_related_uid stores the ID of the object to which the privilege applies, if it’s an object privilege. This has no meaning for table and global privileges, of course. The one applies to a table, not an object, and the second applies to all rows in a table, so an ID is immaterial. This is also not used for self privileges, because by definition a self privilege has to apply to the user requesting permission to do something. It’s a fairly complex table because of all the different types of things it holds. I generally hate columns that mean one thing sometimes and something else other times. When I first designed this system, I put different types and roles in different tables, which ended up being almost but not quite identical. I’ll let you imagine how horrible that was to actually work with. This is much better, and having a single table is more efficient for querying. The first row grants group 4 (users) the privilege to join every event (all rows in the t_event table). 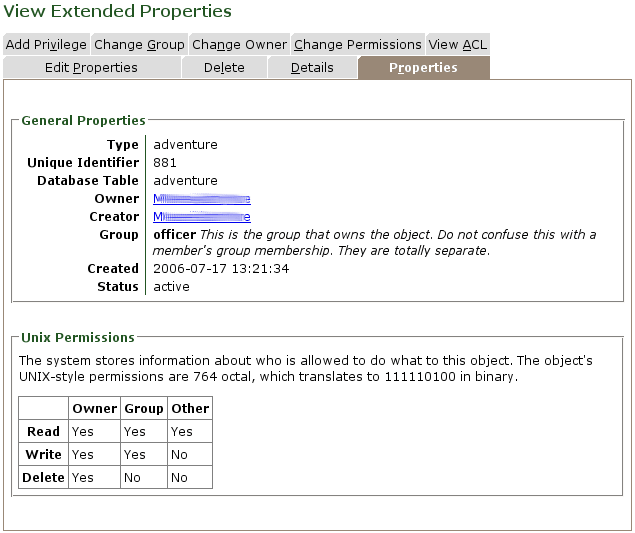 The second row grants all users the right to list the contents of the t_event table. This is the first example of a table-level privilege I’ve given. This is equivalent to setting the executable bit on a directory in UNIX. The third row grants everyone the privilege to change our own password. The fourth row grants user 3 the right to delete event 1. One note on this schema—I have not included the indexes good performance will require. I’ve only included primary keys to ensure data validity. My real application has more indexes on t_implemented_action and t_privilege. The user’s ID and group memberships. The type and identity of the thing in question. In case it’s an object, you need to know the table it lives in, and its c_uid. In case it’s a table, you just need to know the table name. The UNIX-style permissions don’t specify anything about the “join” action, so I’ll skip them. The “join” action is valid for objects. The object’s type is t_event, and the “join” action is defined for that type, but not in status 2—only in status 4.
xaprb cannot join the event. Can he join the ‘Microsoft Keynote’ event? The first two steps are the same, and this time the event’s status matches, so we can go to the next step. … this goes on for a long time. I’m not going to type all the possible combinations of columns and values. This is exactly why my old privilege system was buggy and bloated. Fortunately, it’s really not bad to express this in SQL. All object privileges shows you every privilege a given user has on an object. All table privileges shows you every privilege a given user has on a table. All ACL entries shows you all ACL entries defined for a particular object. Update: a new query—All actionable objects shows you all objects a user can take a particular action on. How efficient is it, really? Pretty darn efficient. The all-object-privileges query really only needs to join a single row (the object) through the t_implemented_action table to the t_privileges table, so the query is only as big as those two tables. My sample queries include the t_action table, because I tend to use it to define GUI labels for my application, but otherwise t_action really isn’t used in these queries. Remember, one of my design goals is to keep the privileges table small. That’s why I built in the complex, but efficient, self roles and global privilege types. You can really say a lot with a single global privilege. If you need to optimize this system further, there are lots of opportunities to omit information, shrink column sizes if you don’t need 32 bits (for example, you may only have a few groups), and so forth. You can also pick and choose which features you want; drop the UNIX-style permissions if you need to, for example. If anyone wants to benchmark this system, I’d be interested in the results. I have never done it. All I know is it works better than it used to, and when I run the queries, they are fast. The largest application I use this on has 122 rows in t_privilege and 672 in t_implemented_action. This is really what determines the size of the query; you should be able to have ten or ten million rows in the tables that store your objects, and that should make no difference. If you do want to benchmark the system, please don’t do it without putting indexes on tables. As I’ve said, I only included primary keys in this article. What’s ugly about this system? I’ve just shown you essentially the same design I use in my production system. It is a strange mixture of different things that don’t always make much sense together. For example, why not just drop the UNIX-style privileges and put a couple extra rows in t_privilege instead? I could do that easily, and my queries would be simpler. The entire system would be more consistent. In fact, if I were starting from scratch, I might do that. I’ve let you see this design in this article so you can make up your own mind about which features you want to include. One thing I’d be reluctant to give up is the laziness the UNIX-style privileges give my code. For the vast majority of uses, my code just wants to know whether the user is allowed to read or update an object. That can be answered without a trip to the database, so it’s an efficiency. I have also never really needed the “other” role in the t_privilege table, so I haven’t written the queries for it (check the queries!). That means my “other” role is implemented in the UNIX-style privileges only. It works for me, though it’s slightly inconsistent. What’s missing? How can you extend this system? I’ve deliberately omitted a few things. One is negative privileges, which deny someone the right to do something. This would not be hard to add—I’ve just never needed it! You could do an exclusion self-join against negative privileges to implement this, and store the negative privileges in the same table. Another possibility would be using more bitwise logic to negate privileges. I’ve honestly never put too much thought into it. I hope my sample queries (which are almost identical to my production queries, by the way) give you enough insight to figure out other special things you may need, such as the “creator” or “supervisor” roles I mentioned. Another possibility is packing more bits into the UNIX-style permissions. My examples only use 9 bits. If your application is constantly asking whether some other action, besides read/write/delete, is possible—hey, use those extra bits. Or if you want, put another role besides user/group_owner/other into the UNIX-style bits. Just because I modelled after UNIX doesn’t mean you can’t do it differently. There’s lots of room to play with the table structures. For example, my production system has extra columns on t_action and t_implemented_action to define labels and other things my user interface wants. How does this compare to other systems? I hate comparisons for their own sake, so I’ll only say my table schema is as simple as I could make it and still jam all the special cases in. There are only a couple of tables, and no complex hierachical relationships between them—everything is flattened out and de-normalized as much as I can think to do. By comparison, phpGACL uses 18 tables to represent relationships among Access Control Objects (ACOs) and Access Request Objects (ARO). These systems may work better for you, especially if you need a more traditional hierarchical ACL. Fortunately, I’ve always been able to accomplish what I need without hierarchy and with just a few groups, some custom roles, column defaults, lots of bitwise arithmetic, and special types of privileges. And I have managed quite complex data with this schema, such as inventory and accounting systems together in the same application. How can you integrate this with a web application? I use the same query to populate drop-down menus and so on. My web app also uses url rewriting to funnel requests through a central dispatcher, which reads the URL and decides what file should handle the request. Before that happens, though, it verifies that the user is authorized to do what the URL requests! For example, my URLs look like http://www.site.com/event/list_all/. The dispatcher looks at the URL and realizes the user is trying to take the list_all action on the event type. It runs the appropriate fetch-all query and sees if list_all is allowed. If so, it dispatches the request. The file that handles the request can focus on business logic instead of handling authorization, because it knows the user is pre-authorized. This is what I meant in my first article, when I said access control should be at the heart of the application, not bolted on. As a result of this design, most of the pages that actually do something only need a few lines of very focused code. This approach has also allowed me to factor out virtually all common code. I can’t think of any duplicated code at all right now, though I’m sure there is some. I’m not trying to brag; I just want to share with you how this has been a success for me. Suggestions for improvements are welcome. I hope this article has been helpful for you.